Have you ever wished that you could create new random wallpapers for your Android phone (or tablet) at any time? 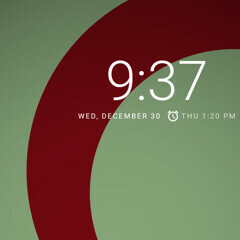 Well, you actually can do that, thanks to an app called Tapet - Infinite Wallpapers. Tapet uses math to generate wallpapers that automatically fit your device's screen resolution. All images are generated on your device, and most of them seem to draw inspiration from Google's Material Design - which is a good thing if you're fan of abstract wallpapers. As an app, Tapet is very simple to use: swipe up to generate a new wallpaper, swipe down to generate the previous one, swipe right to change colors, and swipe left to change the patterns (while not changing colors). When you like what you're seeing, hit the Apply button to make that your device's new wallpaper. You can also use Like and Dislike buttons to allow the app to learn what kind of patterns and colors you like. Tapet is free to download via Google Play (see the source link below), and you can generate as many free wallpapers as you want. However, the app also offers many "premium" wallpapers that you'll have to buy if you want to use. Have you tried Tapet? Or do you plan to? Let us know in the comments section! Once you install and open Tapet, it'll greet you with a short intro to learn the basics of it. And then you'll be able to generate wallpapers just by swiping - up, down, left, and right. This is an example of a wallpaper that you can create. That's the app that you're looking for. And another one - set as our default wallpaper. This is a bit old. Slow news on New Years eve. Try Minima. Not infinite but random and dynamic Material Design wallpapers that really pop. i heard this one before and yes, 500 firepaper is little better it has some cool wallpaper i havent tried this one yet, but i was wondering, whats the effect on battery??? anyone had issue??? There are many wallpaper apps. Tapet however is the one that I always come back to again and again for the most pleasing backgrounds.